Some things just pull at your heart strings as soon as you see them. Is this not one of the cutest tops you've ever seen? 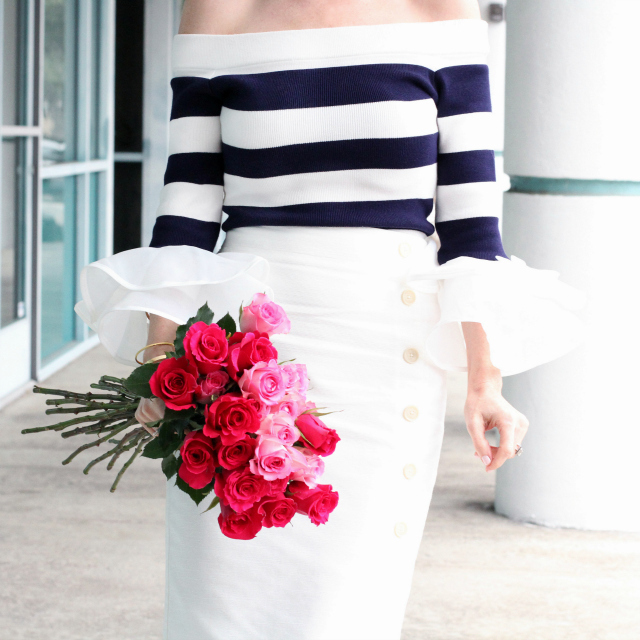 The navy stripes, the dramatic, chiffon-like bell-sleeves with tiny ribbon bows...it's feminine, flirty perfection, ladies. 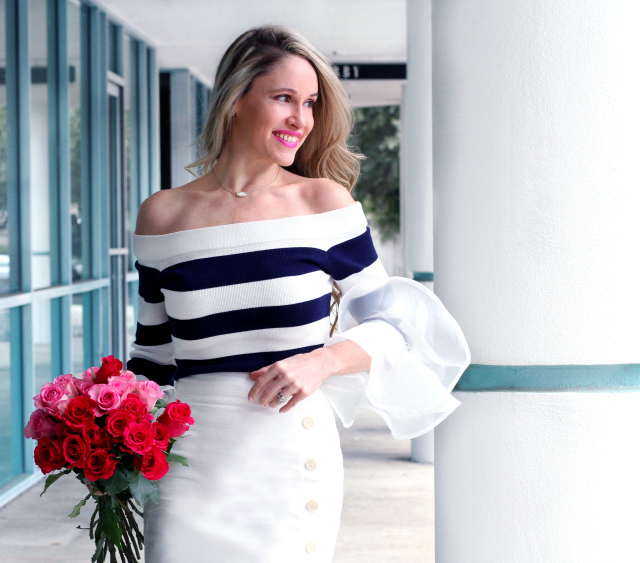 You know I rarely wear off-the-shoulder tops since I'm limited to specific occasions to wear them, but once I saw this one online, I knew it would be the most darling top for date nights, parties, or even just a fun girls' night out. It's definitely an attention-grabber! It's also a great Valentine's/Gal-entine's Day top (inspiration for next year, for those of you who celebrate.) And with an affordable price tag of $35, you really can't go wrong. Since the navy stripes give it a slightly nautical feel, I styled the top with a high-waisted, side-button pencil skirt in winter-white. The buttons are a nice nod to a sailor skirt, playing into the nautical theme, yet remain subtle. Since the top is already quite dramatic, it was important that I keep the rest of the look sleek and understated; the last thing I wanted was to slip into dangerous territory of being "costumey." So, I chose a silhouette and color that both do a nice job of balancing it all out. 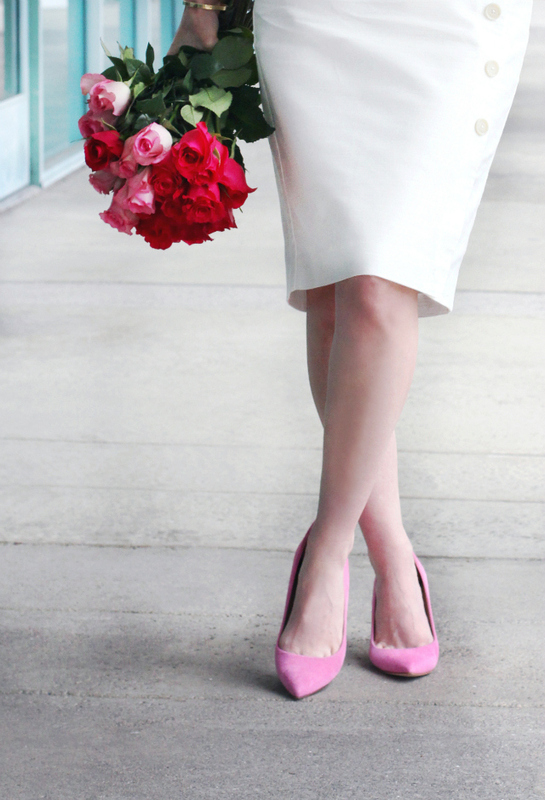 For a pop of color and extra feminine flair, I opted for my favorite pink suede pumps. Pink and navy always complement each other beautifully, and it's one of my favorite color combos. Plus, since this was my date-night look, I wanted to feel extra pretty, and pink suede pumps never fail me. I hope you enjoyed this fun, feminine, flirty look as much as I did! Thanks so much for stopping by, and I hope you have an amazing, love-filled day! P.S. Since first sharing this look on Instagram as mentioned earlier, it appears that sizes in this top are already very limited, so if you love it, snag it! And if your size is currently sold out, be sure to bookmark the page and keep checking back for pop-ups!